Teatox's are the latest new craze. All I have seen over social media the last couple of months has been all about Tea that primarily makes you lose weight and I have been curious to how great they actually are. 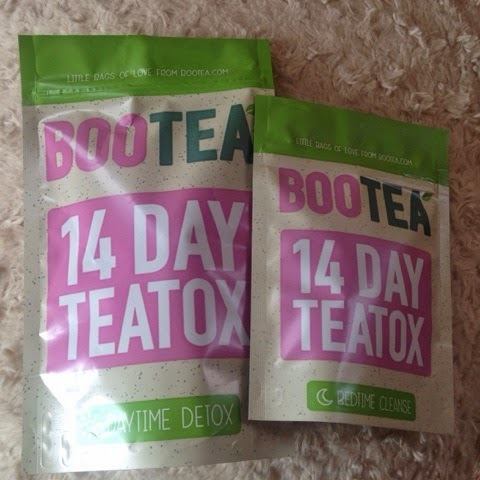 I have previously written a post about the Skinny Mint teatox, and more recently I have been trying the other well known tea, 'bootea'. Now I have finished both of their 14 day programs, I thought I would compare the two so anyone who is indecisive will hopefully be slightly more wiser after reading this. Daytime - Chinese Oolong tea, mate leaves, ginger root, fennel seeds, lemongrass, dandelion leaf, nettle leaves, ginseng root, gotu kola leaves. Night time - Senna leaves, peppermint, fenugreek seeds, liquorice root, burdock root, hawthorn, valerian, psyllium seeds. Daytime - Green Tea, Yerba mate, Nettle leaves, dandelion. Night time - Ginger root, Orange leaves, Lemongrass, Senna Leaves, Liquorice root. Both teas are used in the exact same way. For the best results you need to drink the day time tea every morning with your breakfast (or whenever you get a chance during the day) pouring a cup of near boiling water in a mug with one tea bag and leaving to brew for 3 minutes before drinking. The night time tea needs to be taken every other night before you go to sleep for the duration of your program. It will induce a laxative effect to naturally cleanse your body (so don't be worried if this occurs). Same as the day time tea, you pour near boiling water into a mug with one tea bag and leave to infuse for 3 minutes before drinking. If you already drink fruit teas then you are likely to love both of these. I however, never used to drink flavoured teas and stuck to the standard English breakfast in the morning and throughout the day, so for me it took a bit of getting used to. After a couple of days I got really into skinny mints morning tea, I found it really fruity & refreshing, I could really taste and smell a grapefruit aroma from the tea. I paired this with my usual choice of breakfast; Jordan's Apple & raspberry granola with a handful of fresh blueberries. On to the night time tea... This really was foul in my opinion. I found myself forcing it down my neck before bed which wasn't that pleasant! It just tasted like hot ginger water, I really wasn't impressed. The morning tea had a lot to live up to after I tried skinny mints amazing version. It wasn't as fruity as skinnymint, but it was equally refreshing. The flavour I found that came through most was a lemony citrus taste. Bootea night time tea couldn't have been any worse than the skinny mint version so I was curious to how this one would taste. On first impressions it wasn't very nice (what is it with evening teas?!) but it was drinkable. Slightly similar to the morning tea but more peppermint flavours coming through. I got used to it after a couple of sips but I think calling it 'nice' would be a strong word! The daytime tea I found really woke me up and made me feel a lot more energised during the day. I felt like I could last longer in the gym which is a change from feeling like I'm about to die every time I step off the cross trainer! After the 14 days my muscles looked more defined in my abdominal area too which was great after all my hard work in the gym. The night time tea although vile tasting did make my stomach appear a lot less bloated which was great, it's good to know that I wasn't forcing it down for nothing! The day time tea was very refreshing and also made me feel more awake during the day. I am someone who is always drowsy so feeling more energenic is a a major plus side for me. The evening tea didn't didn't seem to have too much of an effect on me, but both teas effect people in different ways depending on shape, size etc. on me I just didn't see any help with bloating or muscle definition. I didn't take either of these programs with the hope of losing any weight. Although it is meant to help with weightloss, I bought the tea with the hope of feeling generally healthier, more awake, less bloated etc. I have however lost a few pounds since using them, but I have also been going to the gym regularly and trying to eat healthy, so I cannot give all the credit to the teatox, as I am just not sure if it is entirely to do with either of them :). My winner out of the two would have to be Skinny mint on this occasion. This is based on everything I have mentioned above. 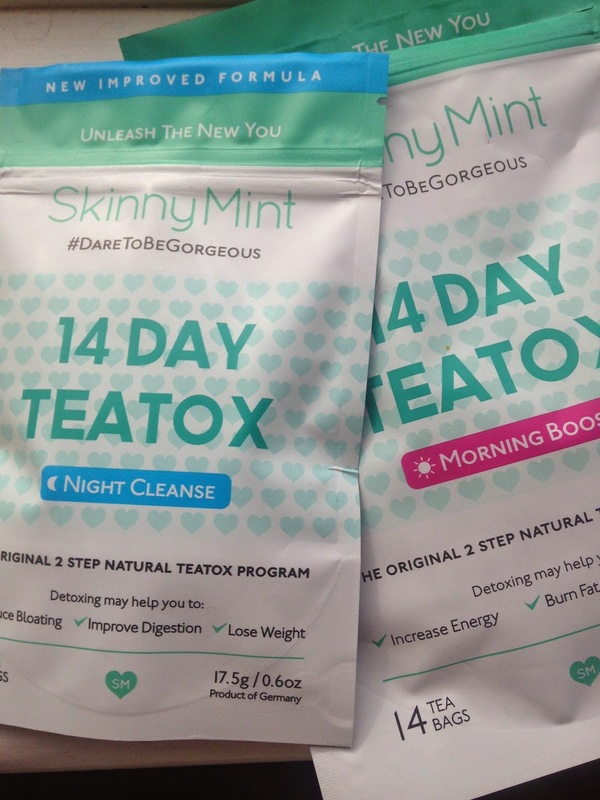 Skinny mint gives the same if not better results as Bootea, has a tastier morning tea and is the cheaper option. I just wish they would change the flavour of their night time tea, it wouldn't have made the decision so difficult then! I hope this has helped all of you that are considering trying a teatox, please remember that my opinions will not necessarily be the same as what yours might be, so I encourage people to try them with an open mind! ENTER MY 2017 MAC LIPSTICK GIVEAWAY HERE!